Naomi Cleghorn '89 (naomicleghorn.weebly.com) says that she "wanted to be an archaeologist from the time I was about 14." She isn't sure exactly when she first became interested in archaeology, but she thinks it might have been related to spending "a lot time in my childhood in the Natural History Museum." 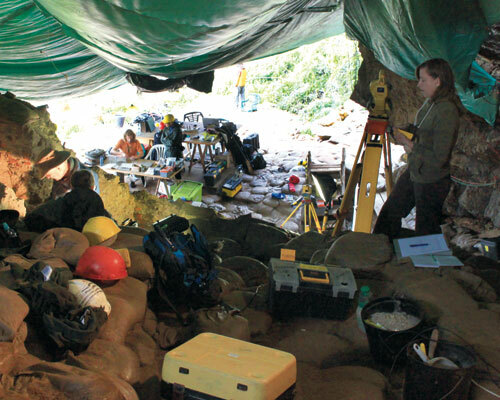 Cleghorn is now an an Assistant Professor of Sociology and Anthropology at the University of Texas at Arlington, and she has traveled the world conducting archaeological research into human origins. Dr. Cleghorn's work in the Caucasus Mountains of southwestern Russia was recognized by National Geographic and the New York Times in September 2010, when she and her collaborators published a paper in Current Anthropology highlighting evidence that the disappearance of Neanderthals in that region coincided with a volcanic eruption between 45,000 and 40,000 years ago. The opportunity to work with Russian scientists reminded Cleghorn of her internship at the Smithsonian during her senior year at Blair, when the Natural History Museum hosted Crossroads of Continents, an exhibit on the cultures of Siberia and Alaska jointly prepared by the Smithsonian and the Soviet Academy of Sciences. It was a rare glimpse into the Russian science community in the waning years of the Cold War. Her Ph.D. thesis work was completed in Russia, where Dr. Cleghorn analyzed faunal (animal) remains at Mezmaiskaya Cave. Because there are very few "cultural remains" such as architectural ruins or artwork when studying paleolithic sites, Cleghorn explains that "most of what you have are stone tools, faunal remains, and evidence of how people have moved things around.” At the Russian site, Cleghorn observed a difference in the evidence of fauna at different times: In levels of the site corresponding to Neanderthals, "there were also a lot of large carnivores using that site.” But when early modern humans showed up, "all large carnivore use of that site dropped out.” She theorized that modern humans were using the site more intensively than neanderthals and possibly excluding large predators from the area by "focusing on a particular part of the landscape." In addition to her research, Dr. Cleghorn also teaches several classes at UT-Arlington, including Biological Anthropology and Human Osteology for undergraduates this semester. She has found that teaching can require just as much work as research, and she remembers the challenge of writing courses for the first time when she first started as a junior faculty member: In her first semester of teaching, she estimates that "I wrote over 900 pages of notes.” Luckily, it has gotten easier to teach courses the second or third time around, although she still "work[s] hard to make them better every semester." Last year, her efforts were recognized with an Outstanding Teaching Award. Dr. Cleghorn remembers many influential teachers from her own education, and from the Blair Magnet, Ms. [Eileen] Steinkraus stood out as "really inspirational." Cleghorn was actually in one of Ms. Steinkraus's classes in middle school, and they both moved to Blair at the same time. As a member of the first Magnet class, Cleghorn remembers "being really happy that I had that opportunity and had those resources." One of the best aspects of the Magnet that she remembers was being placed in a block group of students freshman year who took all of their classes together: "You can step into that big high school and become anonymous [but] being in that small cohort was great." Outside of the Magnet, Dr. Cleghorn remembers the "mindblowing" experience of taking Anthropology from Ms. [Jessie] Diffley at Blair. It was the first time Cleghorn remembers thinking about "how culture frames your perception of the world," and it influenced her career trajectory, pushing her towards the study of human origins. From her internship at the Smithsonian Museum of Natural History senior year, Cleghorn also remembers Dr. Melinda Zeder, who was "infectiously enthusiastic" about zooarchaeology. Cleghorn looked to Dr. Zeder as her first model of a woman archaeologist with kids, and she has worked to strike that balance with her own family. This past summer, Cleghorn was able to take her 12-year-old daughter to South Africa, and she was happy to see her daughter get interested in learning about all the different things that happen at an archaeological site. It remains to be seen whether, like her mother, she will be able to decide on a career by her freshman year of high school.